Every year, the industry's top country crooners celebrate new songs and talent at the Country Music Awards in Nashville. The red carpet sets the stage for epic fashion, and stars are no stranger to Hayley Paige's red carpet designs. For this year's 2018 awards, actress Katie Stevens went for an edgier look in the brand new Wednesday Dress, with straps that read 'Just Got Paiged'. 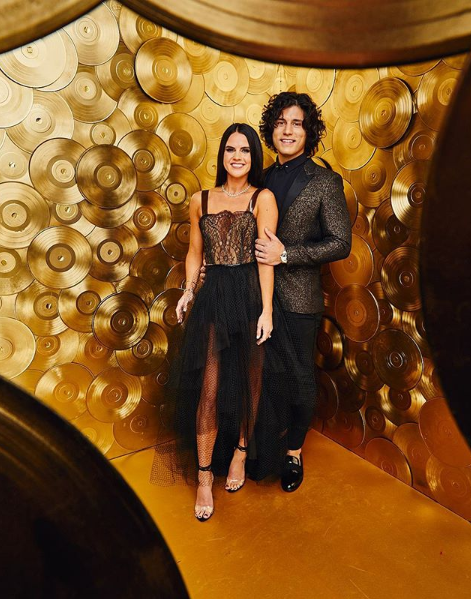 Abby Smyers, wife to Dan Smyers of country duo Dan + Shay also wore black and looked stunning in the Axl dress. Let's take a look at past country singers who have donned Hayley's fabulous frocks for the Country Music Awards and stay tuned to see more styles at future red carpet events! Last year, up-and-coming singer, Carly Pearce, stunned in the Lumiere dress with an embroidered bodice and sheer skirt. In 2016, a few ladies wore various red carpet styles. Olympian Aly Raisman looked luminous in the Merlin dress with galactic embroidery, while actress Hayley Orrantia popped in color wearing the Swift dress. Former Bachelorette Kaitlyn Bristowe cropped it like it's hot in the Bradley dress.